Cape May is a great place for kids! There’s always something going on to delight young people, and the town is very child-friendly! When the sun’s shining, there’s nothing better for a young family than to head to the beach, play in the sea, and build sandcastles! Kids also adore the lighthouse, and find plenty to amuse themselves in the town and its surrounds. If you’re thinking of bringing the kids with you on your Cape May vacation, here are a few family-friendly suggestions to keep the little ones amused. This is perhaps the most obvious suggestion! Arguably Cape May’s major feature is its coastline, featuring some of the most fantastic beaches in the entire USA. Cape May’s beaches are widely acknowledged to provide the archetypal ‘beach experience’ that everyone dreams of when they’re considering a beach vacation. What’s more, they’re very safe, with lifeguards on duty during the summer months and plenty of safety precautions available. If you want to relax, paddle, play in the sand, and return home at the end of the day with your kids happy and exhausted, you could do a lot worse than head to the beaches of Cape May! If your kids are interested in collecting shiny pebbles known as ‘Cape May Diamonds’, head to Sunset Beach on the western side of town. However, you can’t really go wrong with any of the others, either! If you’re feeling a little more adventurous, you could take a stroll along the coast, or hop aboard some bicycles and set out on the Cape May Shoreline Ride. Just be sure to take all the right precautions beforehand, and to follow New Jersey’s bicycling bylaws! What child is not intrigued and excited by the concept of a lighthouse? It brings to mind thrilling images of storm-lashed ships, the lonesome lighthouse keeper, the beam of warning light sweeping through the rain. It’s an exciting and romantic concept! The Cape May lighthouse resembles pretty closely every child’s image of what a lighthouse should be. The current structure dates from 1823, and is still working as a beacon for seafarers! The lighthouse is situated within Cape May Point State Park, which is in itself very much worth a visit. It’s a beautiful area, full of nature trails and so forth to delight the kids. There is a visitor center and a museum at the foot of the lighthouse and, during opening hours, people have the opportunity to climb right to the top and look out over Cape May and the ocean. Not to be missed! It’s rare to meet a child who isn’t fascinated by rare animals, and the Cape May County Zoo offers them the chance to meet more than 550 animals! You can enjoy the sight of flamingos, giraffes, bears, lions, tigers, monkeys, and much, much more! While the zoo does ask for donations, there is no set entrance fee, meaning that you can make this experience fit in with a budget. Similarly, while there is an excellent zoo cafe at which to purchase food, you are also very welcome to bring a picnic and eat in the free picnic area. The Cape May Nature Center is a lovely little place which goes out of its way to ensure that kids have a great time. You can head in to spend time learning about nature on spec, or you can book your kids onto one of the fun and educational programs which the center offers on a more or less daily basis. The programs are well run, and generally involve a lot of guided, hands-on exploration in the natural world of Cape May and its beaches. With authorities increasingly warning us about the dangers of childhood disconnection from nature, this is a great way to get your children in touch with the natural world, and maybe develop a lasting and healthy passion for all things nature! Don’t worry – though this may sound more ‘health and education’ than ‘fun’, the staff at the center are very good indeed at ensuring that the children they work with really enjoy their day, and come back raring with enthusiasm for what they’ve seen and done! Check local events in Cape May with the family here for the summer season. This entry was posted in Cape May Resort Blog and tagged Cape May Things to Do, kids things to do in cape may, Things To Do With Kids In Cape May on July 27, 2016 by Ryan Reclaim. Welcome to Cape May Resort! Get Ready for Your Summer Vacation at the Jersey Shore Come to Cape May and Enjoy the Great Weather, spend the day at the beach or take a Water Sports trip with the Family. Check out Cape May July Whale Watcher Events here. Visit the Jersey Shore Where there are Things to Do All Summer Long! The Jersey Shore in Cape May During July…a Shore Thing for Fun on the Beaches and on the Water with exciting Water Sports and Whale & Dolphin Watching. Bring Your Mobile Device and check out local Cape May Events, order tickets on line or check the weather before hitting the beach. See our picture of the day parade images here. Departing from the Miss Chris Marina on all days. Check out the three trips every day to fit into your vacation plans in Cape May NJ. Start your July Vacation with a Dolphin Excursion on Board the Cape May Whale Watcher Spirit of Cape May. Experience Cape May in a whole new way! Join us aboard the Cape May Whale Watcher for the first trip of the day as we cruise around the island of Cape May, NJ. See Victorian homes, the Historic Cape May Lighthouse and many other points of interest as your Captain narrates the tour with historical facts provided by the Mid- Atlantic Center for the Arts. 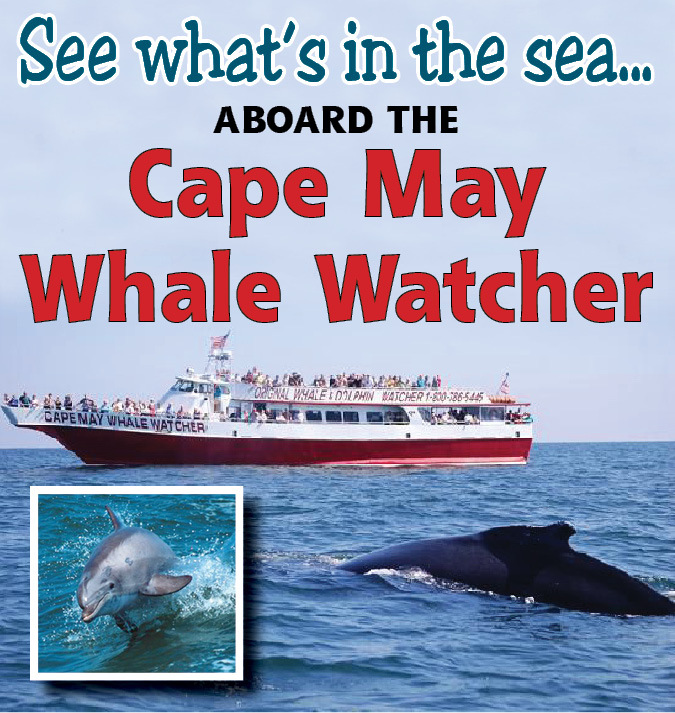 The Cape May Whale Watcher also offers a 1PM Big Trip and a 6:30PM Sunset Dinner Cruise each day. Coming to Cape May this Summer with your iPhone, Blackberry, Droid or Tablet? Why not plan your vacation and events on the go with you hand held device. Cape May Resort.com now offers a fully functional Mobile Platform – capemayresort.com to allow you to purchase WaterSport Tickets, Book Hotels, download shopping coupons or check out local events in Cape May NJ. Looking for Something Fun to Do in Cape May this Summer? Take a ride aboard the fantail launch ” Fancy” out of South Jersey Marina in Cape May NJ with Captain Doug. This 12 passenger boat is one of two made in the US. You can visit local restaurants, go on a sunset sightseeing cruise or get picked up or dropped off at a local marina. Just Call Captain Doug at 609-602-1118 and get picked up and dropped off at the following places. We recently called the Cape May Tiny Cruise and had them pick us up at the Cape May Marina and drop us off at the Harbor View Restaurant to have lunch and listen to some outdoor music. No parking problems and the Tiny Cruise picked up and dropped off our group on time for just 5 per passenger. You can also take a daily harbor tour departing from South Jersey Marina for Just $25 just click on Cape May Resort Simpletix to make a 24 hour advanced reservation or call 609 602 1118. The Summer season in Cape May is in full swing during the month of July in Cape May, don’t forget to visit this month and experience the best events Cape May has to offer during the Month of July including the Cape May Fireworks at Congress Hall NJ. you are looking for more things to do in Cape May this summer season please visit our June events page. Things to Do in Cape May NJ during July. Are you thinking of coming down the shore for a getaway or a romantic evening at a Cape May Luxury Hotel or Bed and Breakfast? Check the local listings and Cape May events as many local restaurants are offering specials along with discount codes for hotels for the special upcoming July and August Holidays. July is the best time of the year to celebrate the July 4th Holiday with your significant other and make some special memories at the Jersey Shore this year. Cape May Labor Day List of Things to Do this Summer. Summer Events for August 2013 Come to the Cape May Baby Parade, attend the National Lighthouse Day at the Cape May Lighthouse, watch a movie on the beach or come to West Cape May and enjoy the Cape May Tomato Festival. Aug 10: 2nd Annual Craft Beer & Crab Festival, MAC,Call 609 884 5504 for More Info Today! Aug 31st: West Cape May Tomato Festival, Wilbraham Park609 884 9325 – Rain date for the Tomato Festival is- Sept. 1st. For a complete list of fun and interesting things to do in Cape May during the upcoming Labor Day Weekend, please visit our Cape May Bucket List of Things to Do During Labor Day Weekend. Ty and check off a few of the many things to do in Cape May before the Summer Ends. Searching for a Vacation Package or Rental in Cape May NJ? Are you thinking of coming to Cape May this Summer Season for vacation and looking for that Cape May Resort Vacation Package? Cape May offers accommodations for every type of stay, including Luxury Cape May Resort, Historic Hotels, Motels on the Cape May Beach and Five Star Bed and Breakfast Inn’s. You can search below by type of Cape May Property be using the Cape May Resort menu bar to search for your Vacation package by type. Simply press on Historic Hotels, Luxury Hotels, Bed and Breakfast Inns or Hotels and Motels to see which properties are available for your upcoming Cape May Stay. Save Money during your visit,Check our or local Money Saving Cape May Promo Codes! Coupons and promotions to keep you saving Money. Nothing to clip totally paperless, simply show your local merchant your Cape May Coupon on your smart phone or tablet to receive the discounted offer. You get reserve tickets for the Cape May Whale Watcher Fireworks Excursions here. The Best Top Outdoor Excursions available during Vacation include Jet Boat Adventures, Parasailing and Jet Ski Rentals. Are you looking for an exciting day excursion in Cape May, the Wildwoods, Stone Harbor, Avalon or Sea Isle City NJ? Cape May Resort offers the best handpicked Water Sports and Outdoor Excursions daily packages.If you are planning a Visit to Cape May, we’ve put together the most popular local events in Cape May to enjoy during your Vacation. Daily adventure excursions from Cape May Whale Watching, to outdoor exhilarating outdoor water sports or a quiet kayak ride on the serene backwaters, we have the event package that your family wants to get the most enjoyment of your vacation time. If you are looking for that special event or outdoor excursions in Cape May, check out our event offerings today. Rent a Jet Ski in Cape May – Whether you are visiting Cape May for the first time or have lived here all your life, there are plenty of exciting or relaxing things to do in Cape May. Cape May Resort.com prides itself on having the best Water sports and Outdoor attractions. Working with the expertise of the local Captains, we have put together the five most action oriented Water Sports excursions in Cape May. Expect to get wet, get lifted up to 500 feet in the air, experience 180 degree turns or view dolphin schools or whales off shore. This is the only way to create your own personal unforgettable vacation memories in Cape May. Spend a day at the beach, or go Parasailing, take a Jet Boat Ride or Rent a Jet Ski. Why not spend a summer afternoon Whale and Dolphin Watching? With a membership of over 900 members, the Cape May County Chamber of Commerce represents the largest number of businesses and organizations in the County.The mission of the Cape May County Chamber of Commerce is to be the voice of the business community by promoting tourism and economic development through legislative advocacy, marketing services, networking opportunities and education programs for member businesses. A strong Board of Directors, nine action committees, and a year round, professional staff work together to accomplish this mission. This entry was posted in Cape May Resort Blog and tagged Cape May August Activties, Cape May August WaterSports, Cape May July and August THings to Do, Cape May Summer Events, Cape May Summer Events August, Cape May Summer thing to Do, Cape May Summer things to do, Cape May Things to Do, Cape May THings to do in the summer, Cape May Whale Watching Summer Events on August 26, 2013 by Ryan Reclaim. Twenty Labor Day 2013 Things to Do in Cape May NJ, check off your bucket list before the Summer Ends this Year. Labor Day is on Monday September 2nd , Labor day is always celebrated on the first Monday in September and marks the official end of the summer beach and vacation season in Cape May. It’s been a long hot summer in Cape May NJ and you’ve got plenty of things to check off on your bucket list in Cape May County. Cape May Labor Day Bucket List of Things To Do – The end of summer is just around the corner in Cape May, before you start dropping the kids off at school, try to fit in one or two of these 20 Things to Do in Cape May during this upcoming 2013 Labor Day Weekend. This entry was posted in Cape May Resort Blog and tagged Cape May Activities in Labor Day, Cape May Bucket List, Cape May Events During Labor Day, Cape May labor day 2013, Cape May labor day events 2013, Cape May Labor Day Things to Do, Cape May NJ Labor Day 2013, Cape May Things to Do, Labor Day THings to do in Cape May NJ, Looking for THings to Do in Cape May during Labor Day on July 31, 2013 by Ryan Reclaim. Here’s our Quick List of Things to Do in Cape May During July 4th Holiday Week. July 4th falls on Thursday this year, the Summer season in Cape May is in full swing during the month of July in Cape May, don’t forget to visit this month and experience the best events Cape May has to offer during the Month of July including the Cape May Fireworks at Congress Hall NJ. you are looking for more things to do in Cape May this summer season please visit our events page. Come to Congress Hall and enjoy the festivities on the lawn and stay for the Fireworks at Dusk during July 4th. The fireworks will be visible from Beach Ave across from Congress Hall. Take a stroll to the Rotary Park located on Decatur and Jackson Street and relax to the live music from the Congress Street Band at 7:30 PM. don’t forget to bring your lawn chairs or come early to get a seat on the park benches. Cape May once again will host its Independence Parade on Beach Ave in front of the new Convention Hall. This event will start on Saturday July 6 at 1PM. Get Reserved Tickets for the Cape May Whale Watcher Now for the July 5th July 8th Excursions, Save Money & Time Order Tickets on SimpleTix. Plan Your Cape May July 4th and July 5th -8th excursion with the Cape May Whale Watcher, departing from the Miss Chris Marina on all days. Check out the three trips every day to fit into your vacation plans in Cape May NJ. Things to Do in Cape May NJ during July. Are you thinking of coming down the shore for a getaway or a romantic evening at a Cape May Luxury Hotel or Bed and Breakfast? Check the local listings and Cape May events as many local restaurants are offering specials along with discount codes for hotels for the special upcoming July 4th Holiday. This entry was posted in Cape May Resort Blog and tagged Cape May Congress Hall July Events, CAPE MAY EVENTS IN TOWN JULY, cAPE mAY ROTARY BAND JULY 4TH, Cape May Things to Do, cAPE MAYQUICK LIST OF THINGS TO DO, jULY 4TH cAPE mAY eVENTS, July Events in Cape May NJ, Things to Do During July in Cape May NJ on July 4, 2013 by Ryan Reclaim. School is Out for the Summer..Come Down to the Jersey Shore and Enjoy Cape May NJ. Get Ready for Your Summer Vacation at the Jersey Shore Come to Cape May and Enjoy the Great Weather During this Week. Spend the day at the beach or take a Water Sports trip with the Family. The Jersey Shore in Cape May During June…a Shore Thing for Fun on the Beaches and on the Water with exciting Water Sports and Whale & Dolphin Watching. Bring Your Mobile Device and check out local Cape May Events, order tickets on line or check the weather before hitting the beach. Cape May Fireworks aboard the Cape May Whale Watcher ,Plan Your Cape May July 4th and July 3rf Fireworks excursion with the Cape May Whale Watcher, departing from the Miss Chris Marina on both nights. Fireworks Cruise for Two Days in Cape May NJ, enjoy the best view from the Ocean overlooking Congress Hall on one day or overlooking the Delaware Bay . View the Fireworks in Cape May During July 3rd or July 4th with a unique perspective. Fireworks displays that can be enjoyed from either land or sea (or bay, or shore). Join the Stewart Family and the Crews of the Cape May Whale Watcher and Spirit of Cape May as we celebrate our great nation’s Independence Day. Come join us on the evening of the 3rd or the 4th of July for our Fireworks Cruise. Boarding on our Cape May Whale Watcher will be leaving the dock at 7:00PM. There is no better way to see the spectacle of lights! Come out on the water and avoid sitting on the crowded Cape May beaches. Everyone gets an incredible view from our boat on the Ocean Side. Get Tickets now for Cape May Fireworks by clicking here. On July 4th we will view the Cape May Fireworks, Oceanside in front of Congress Hall Cape May. On July 3rd we will view the See one of the best Fireworks displays in NJ on the calm waters of Delaware Bay. The First Day of Summer is June Friday June 21st the early Summer season in Cape May is in full swing during the month of June in Cape May, don’t forget to visit this month and experience the best events Cape May has to offer during the Month of June including the Cape May Harbor Fest. If you are looking for more things to do in Cape May this summer season please visit our June events page. Cape May Water Sports Excursions, the Best Top Outdoor Excursions available during Vacation including Jet Boat Adventures, Parasailing and Jet Ski Rentals. Are you looking for an exciting day excursion in Cape May, the Wildwoods, Stone Harbor, Avalon or Sea Isle City NJ. Cape May Resort offers the best handpicked Water Sports and Outdoor Excursions daily packages.If you are planning a Visit to Cape May, we’ve put together the most popular local events in Cape May to enjoy during your Vacation. Daily adventure excursions from Cape May Whale Watching, to outdoor exhilarating outdoor water sports or a quiet kayak ride on the serene backwaters, we have the event package that your family wants to get the most enjoyment of your vacation time. If you are looking for that special event or outdoor excursions in Cape May, check out our event offerings today. This entry was posted in Cape May Resort Blog and tagged Cape May Home THings to Do, Cape May July Events, Cape May Things to Do, Cape May Things to Do Summer Events 2013 on June 26, 2013 by Ryan Reclaim. This entry was posted in Cape May Resort Blog and tagged Cape May July Events, Cape May July Watersports Events, Cape May Things to Do, Cape May THings to do during July, Cape May Things to do for July 4th 2013, July 4th on June 21, 2013 by Ryan Reclaim. Visiting Cape May in the Rain? The forecast calls for a rainy weekend at the Jersey Shore and you’ve come down to Cape May with that special significant other or you have the kids in tow. With a spotty forecast predicted for this weekend and no beach time in sight what can you do to experience the best that Cape May has to offer. Don’t forget it’s Harbor Fest this Saturday June 15 in Cape May NJ. If you are looking for the Top 10 Free Things to Do in Cape May, save your money and gas and click on the Top Free Things to Do in Cape May here. Also be sure to check out the Free Things to Do in Cape May visit the Cape May Nature Center. This entry was posted in Cape May Resort Blog and tagged Cape May Rainy Weather What To Do, Cape may Rainy Weekend THings to Do, Cape May Shopping, Cape May Things to Do, Cape May THings to do during a Rainy June Weekend, Cape May Top 10 THings to Do in the Rain, Free Things to Do in Cape May NJ, What to Do During A Rainy Weekend in Cape May on June 14, 2013 by Ryan Reclaim.